Baby Issy is Coming Home! 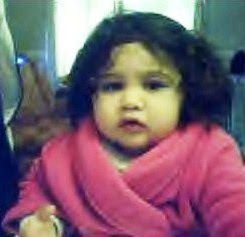 I spoke to my darling Baby Issy via webcam several nights back and the more I see her pictures, the more I think she looks like me when I was a little girl! Baby Issy is such a big girl now and will turn two in September; how time flies right? If previously she was a helpless adorable looking golliwog who is also a Virgo baby like her aunt, she is now a lively and smiley naughty toddler who can't keep still for a minute! When my sister showed me Issy's antics via webcam, I was in awe at such adorable display of affection. Issy had just woken up and was dressed in her cute baby pink robe. Her mommy put on some music and it was such a joy to see my baby niece shaking her thang; dancing and jumping up and down, curly hair bobbing up and down as she danced all around the living-room! She was happily smiling while sending me flying kisses, which got me a little teary since I've not embraced her in a big bear hug for almost a year now! I miss my baby doll a lot but the good news however is that Baby Issy is planning to visit home sometime next month. This means I no longer have to worry about saving up to visit her in UK! I've been seriously looking into several self catering cottages available at Holiday Rentals, the number 1 self catering holidays website in UK, which is where Baby Issy and family are currently located. With the current economic scenario not looking up any time soon, private holiday rental is the way to go. Offering exceptional value for your money on more than 180,000 self-catering holiday cottages, Holiday Rentals lets you enjoy a fantastic vacation for less. Private rentals give you savings up to 50% compared to the average family hotel stay. You can also enjoy the liberty of choosing the perfect type of property for your vacation needs. From self-indulgent luxuries like a private pool or a romantic Jacuzzi to everyday comforts such as satellite TV or internet access, Holiday Rentals got you and all your vacation needs covered. Since Baby Issy and family are coming down for a visit soon, I'll be putting my UK vacation plans on hold for now. If you however are planning a holiday in beautiful UK, drop by today and start planning the perfect, affordable vacation with Holiday Rentals! Yay Baby Issy! :):) Mesti Marzie heppi gils sbb Issy the cutie is coming home yay!! Yeay Issy coming back.. tengak makeover ni.. catch you later! 8-) 8-) 8-) Marvic FC1! I went down makan Mariuca! :* :* :* :* :* :* Debbs FC2! :* :* :* :* :* :* LJ FC3! :-D :-D :-D :-D Monica! :( :( i'm way too late! What a treat for you to see Baby Issy again! Can't wait to hear your stories from her visit...Hooray! Recent blog:=- The Somerset County 4-H Fair is Here!! Oh..cute baby Issy..please give me a kiss and hug to you're beautiful niece. How I wish elisse can visit me here too but very slim possibility. Oh My! Baby Issy had grown so fast! I remember the first time I saw her I fell in love with her right then and there! She is such a cutie and an adorable baby! More pics pleaseeee, Marzie Dearie!